This article examines the spatial variability of dust concentrations within a coal miner’s breathing zone and the impact of sampling location at the cap lamp, nose, and lapel. Tests were conducted in the National Institute for Safety and Health Pittsburgh Research Laboratory full-scale, continuous miner gallery using three prototype personal dust monitors (PDM). The dust masses detected by the PDMs were used to calculate the percentage difference of dust mass between the cap lamp and the nose and between the lapel and the nose. The calculated percentage differences of the masses ranged from plus 12% to minus 25%. Breathing zone tests were also conducted in four underground coal mines using the torso of a mannequin to simulate a miner. Coal mine dust was sampled with multi-cyclone sampling cans mounted directly in front of the mannequin near the cap lamp, nose, and lapel. 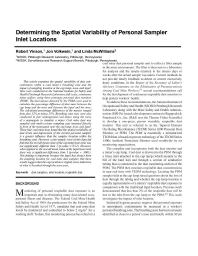 These four coal mine tests found that the spatial variability of dust levels and imprecision of the current personal sampler is a greater influence than the sampler location within the breathing zone. However, a one-sample t-test of this data did find that the overall mean value of the cap lamp/nose ratio was not significantly different than 1 (p-value = 0.21). However, when applied to the overall mean value of the lapel/nose ratio there was a significant difference from 1 (p-value < .0001). This finding is important because the lapel has always been the sampling location for coal mine dust samples. But these results suggest that the cap location is slightly more indicative of what is breathed through the nose area.